As my first encounter with ski slopes happened back in 1977 on the 1st year school trip to Austria, one might think I'd have got to grips with them by now. The whole trip including full board, gear and all week lessons cost £99. This was not wasted as I did learn to ski to a perfectly competent level but unfortunately I haven't improved and with little practice in 20 years, I've lost the 12 year old's competence I'd developed that week. There weren't lot's of opportunities to top up my skills - the next chance being on a trip to Aviemore with 3 school friends when we were 17 and I'd passed my driving test. We stuffed ourselves into my pals mothers Datsun Cherry, squeezing in around the 4 sets of hired ski's and drove up the long mountain road with the windows open and the skis sticking out. We'd never been there before and when I encountered a junction quite high up I turned left instead of continuing up to the main ski resort which I only learnt in hindsight would have been the only sensible thing to do. The left turn took us to a chairlift and run that was like a half pipe - icy and narrow. One of my friends had skied before and the other two had never had a pair of skis strapped to their feet - ever. Getting on the chair lift was no problem, but getting off at the top proved to be impossible and they had to be allowed to stay on to get a lift back down, much to theirs and the operators disgust. I still remember the look of judgement on their faces as they glowered at me, having ignored all my impatient yells of "just jump, for goodness sake!" Karma came quickly in the terror I experienced in trying to get down this run alive and we were all so discouraged that we went back to the village and had a nap instead. I still feel the shame. When our friend Irish Kate came to live in Lochaber and was terribly homesick, I encouraged her to get out and have some fun to keep her mind off Galway. Why not get up the ski slopes and try something not available in the ol' country? Now aged 30 and having recently taken up snowboarding myself (due to becoming so scared of falling whilst skiing and therefore never improving) I thought Irish Kate should give that a go too. It would be a good equaliser as I had only just learnt to stand up on the board - there is no fear of falling down when you can't stand up, so I was enjoying the new experience. What stopped it from being an equaliser was that I at least was familiar with a ski slope whereas Kate had never been on a ski slope in her life. She was so relieved when she was allowed to get off the chairlift carrying her snowboard that she sat it down to take in the view and appreciate still being in one piece. Her board immediately shot straight down the hill, gathering speed at an alarming rate and thankfully not cutting anyone in half. She had to walk all the way back down, and never really developed much of a love for the sport. Clearly I had not learnt how to look after my friendships any better over the last 13 years. On a much later trip to Italy, Spook and I were doing a recce of the facilities and were to report back to The Boss who was coaching our children down on the nursery slopes. We met a rather handsome ski patroller who said he would show us around. He didn't speak English but he and I managed to converse in stilted French. I may have been flirting a little, it's hard to say - it was a long time ago - but it all went wrong when I skied through the stile to access the chair lift and encountered my first ski conveyor belt. I ground to an instant halt on the rubber, non slip surface, and fell over with my legs all tangled up, ski's pointing in very uncomfortable directions. Worse than this was that the belt kept moving and the empty chair kept approaching and I thought that bits of me were going to be cut off as I desperately tried to flatten myself to the ground. The handosme ski patroller, the lift operator and Spook were all laughing heartily as the operator lazily leant forward and stopped the machinery. I think I may have been whimpering. I went on to learn how to stand up easily on a board and slip slide down a slope, but never to do that 'falling leaf' motion that makes snowboarding look so comfortable and fun. That there was only one plank and not two attached to different legs had it's attraction, but I then became afraid of falling over again and that was that. Back to square one. 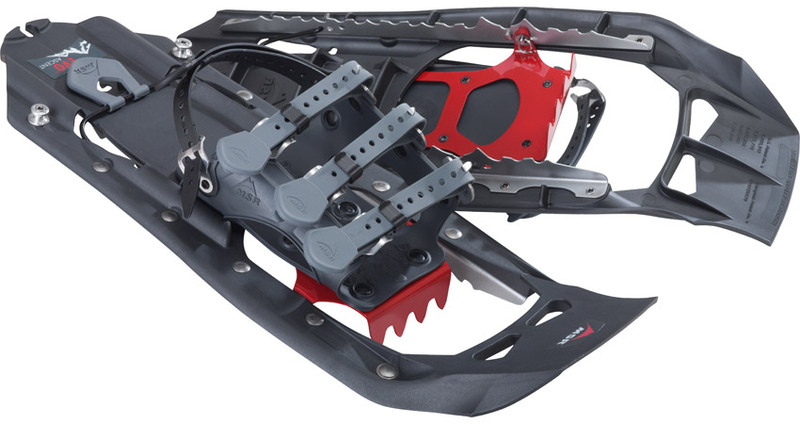 In an online conversation with our friend Canadian Ken, he suggested I give snow touring a try and perhaps discover the pleasure of walking in snow shoes. It all sounded a little expensive until I discovered that Nevis Range hire out snowshoes for £14 a half day or £18.50 for a whole day. These shoes cost well upwards of £150 so that sounded like a bargain. I had in mind something from a Grizzly Adams movie - like a couple of tennis rackets strapped to my feet. And they had tails attached to help with deeper snow. The snow was plentiful and the sun was shining. I hadn't been to the summit for years, and was determined that view up there would be mine for the seeing. I picked up my shoes at the bottom and took a lift on the gondola to get a head start up the hill. At £16 that's a whole lot of effort saved. And I forgot ski poles. And I forgot that going up a hill under your own steam no matter how fancy yer shoes, is bloomin' hard work and nothing short of a jet pak was going to help seeing as how I wasn't on the slidy equipment that functions on the tows. Lot's of people called out encouraging words, held out hands that were of no help, or reassured me that I was nearly there. This is WAY steeper than it looks and I wanted to crawl, but snowshoes are not conducive to crawling. Really - I have got to take a snowboard lesson! My spirits lifted on the final walk up the summit run as Spook and The Boss glided by on their skis. All I had to do now was get all the way back down. I'd climbed 1815ft, but only travelled 1.4 miles. The staff at the summit tow had assured me that the shoes would perform well on the way down. 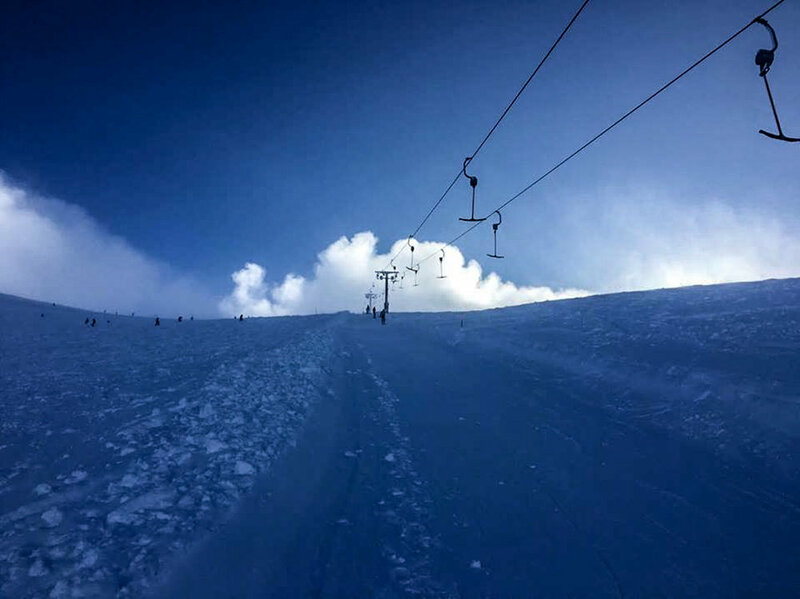 They had certainly saved me a lot of effort compared to the set of boots that I could see had forged their way ahead of me on the T-bar tow route, their prints deep in the snow, compared to mine on the surface. But they were probably fitter and less naive than me. 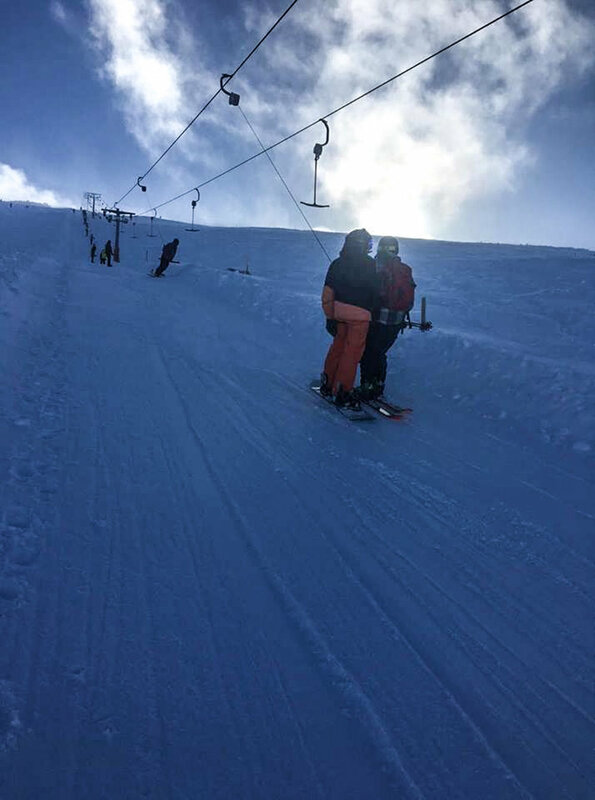 The Boss and Spook said they'd wait at the bottom of Summit Run to see how I was faring. A last look at the effects of the snow and I was off at reasonable speed. The shoes demonstrated their real potential immediately, as I chose the off-piste lovely thick but light snow. They cut through the surface to slide comfortably on a layer below and softly came up for the next step. Old creaky knees didn't creak and it was like walking on how you imagine clouds might be if you didn't just fall straight through them. I wasn't far behind the two skiers, though they had waited for me. I chased them on and having tested the shoes on the pisted slope, went back to choosing powder snow of which there was an amazing abundance. Instead of dragging my feet in thick snow, it was like having springs on. No fear of falling, despite a couple of gentle tumbles when I stood on my own shoes, this was the most fun I'd had on a slidey surface for years. I know that the Lochaber Mountain Rescue Team are trialing them for their long walks into and up the hills and no wonder. As I soon descended and met up with my companions, we did all wonder at my determination to go to the summit. I hadn't considered that I could walk out either side from the top restaurant to take in great views on pleasant routes that would not have torn my guts out. I didn't even have to come up the hill at all, as there is lot's of snow in Leanachan Forest and I could have hired the shoes and gone for a long walk along the trails. 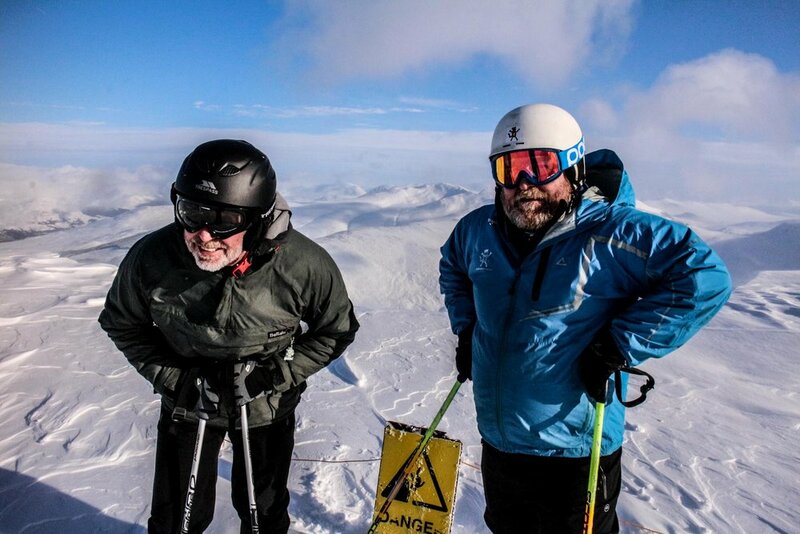 Thanks to Canadian Ken for his suggestion and so much to Chris, Nicky and Nevis Range for letting me give it a go. I may not have inspired the skiers and boarders as they slid past me up that tow, but I was grinning widely on the run down. The uninspirational Mo hanging on to The Boss, not realising at this point that the fun was about to start.